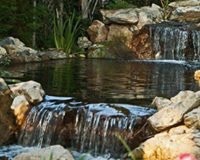 If you installed a water feature (stream with waterfalls, pond, fountain) in recent months, you are in for a surprise winter gift. 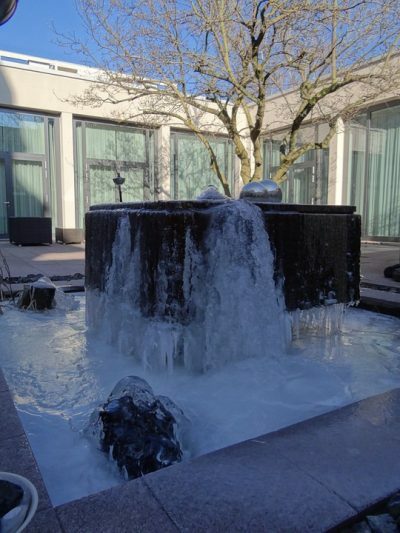 As temperatures stay cold, this outdoor flowing water will crystalize, transforming drops and streams into delightful pieces of art. 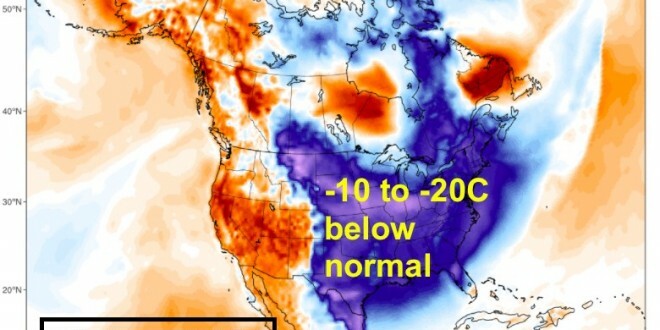 Winter in some parts of the country can be long and harsh. 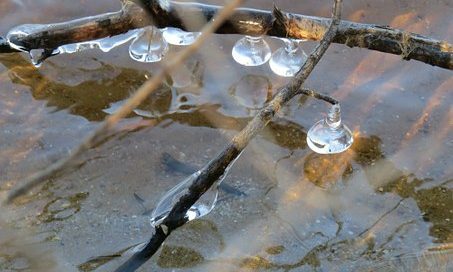 And there are those who choose to close down a pond or waterfall/stream in winter. There are easy steps to do that, including shutting down and removing the feature’s pump. Tip: Aquasacpe Inc. (International pond/water feature experts ) suggest storing the pump in a frost-free location, submerged in water to keep the seals from drying out. However, here on Long Island, winter is more sporadic in its assaults. 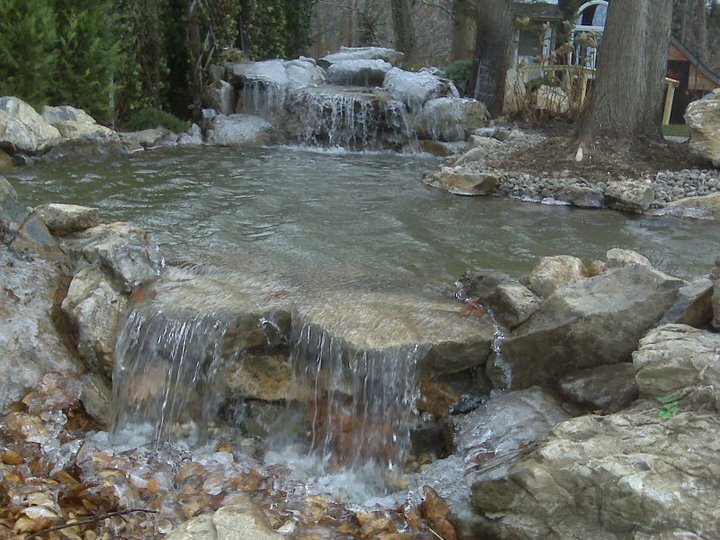 Keeping a feature’s water flowing in winter allows homeowners to enjoy ice sculptures whenever the cold stays around for awhile. 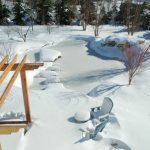 Deck and Patio, for example, certainly keeps our own water feature operating at our design studio all winter through. 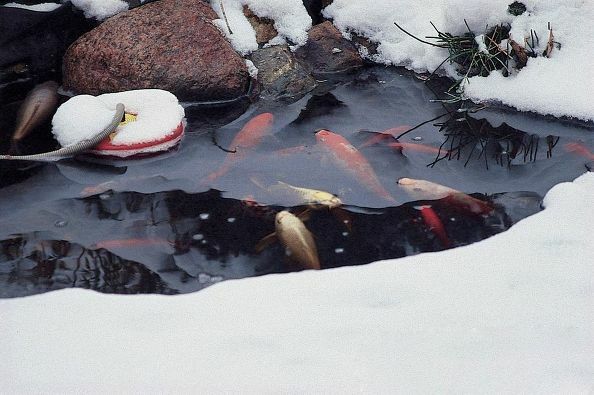 Running your water feature in winter can be especially helpful if you have pond fish. The continual movement of water discourages freezing where the water falls into the pond. 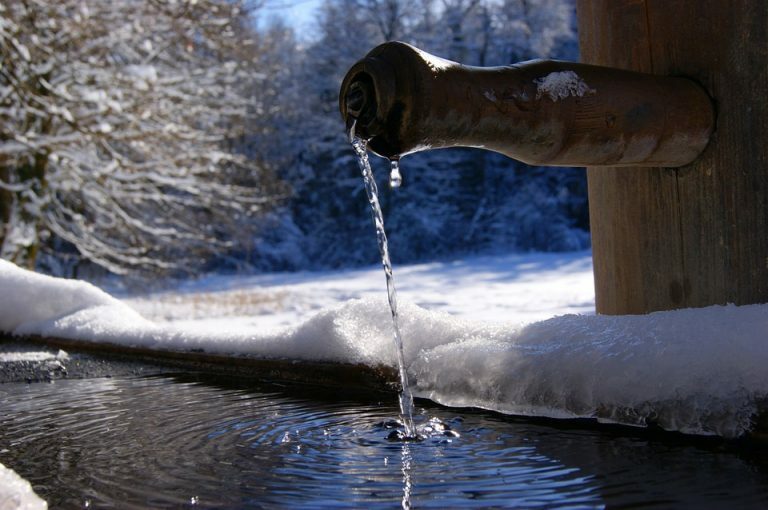 Along with an aerator, the flowing water should maintain a hole in any ice that forms. 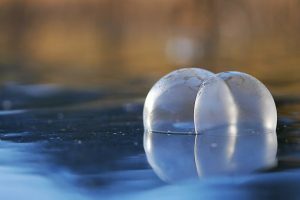 A hole lets any harmful gasses escape and not build up under the ice and harm the fish. 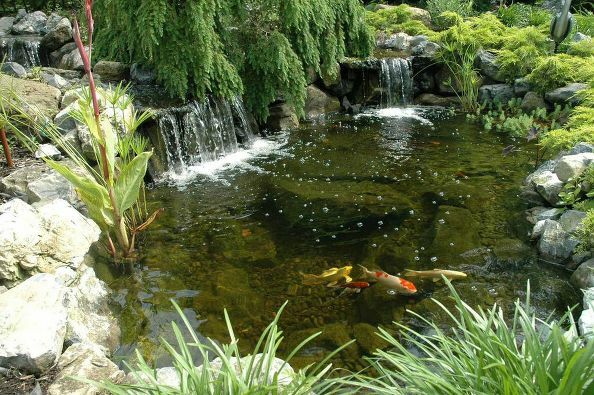 Read more on how to care for pond fish here. Below are some examples of the beauty winter can sculpt in your yard with the help of a little flowing water. 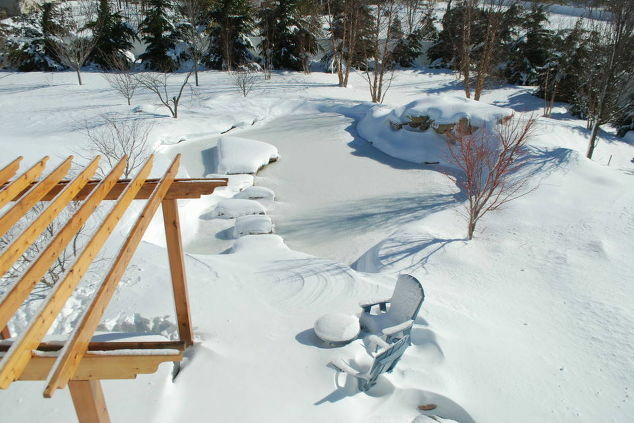 The above pond belongs to one of Deck and Patio’s clients. When we stopped by to do some maintenance during a prolonged cold snap (right), we couldn’t resist photographing it. Note how the ice forms on the natural stone boulders; the water falling over the stones crystalizes into glistening flowing threads. We thought it an exquisite site. The photo (left) is the same pond in summer and winter. 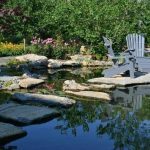 Small decorative waterscapes like this fountain/miniature pond feature are delightful in winter months as well as summer. 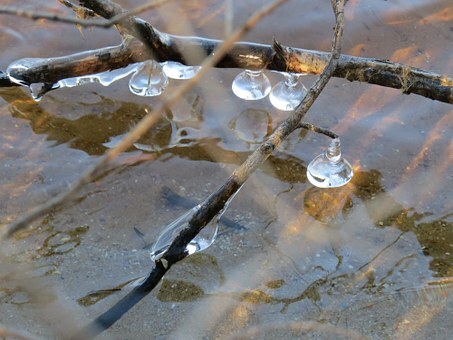 Note how the small trickle of water has become a jeweled thread of ice. 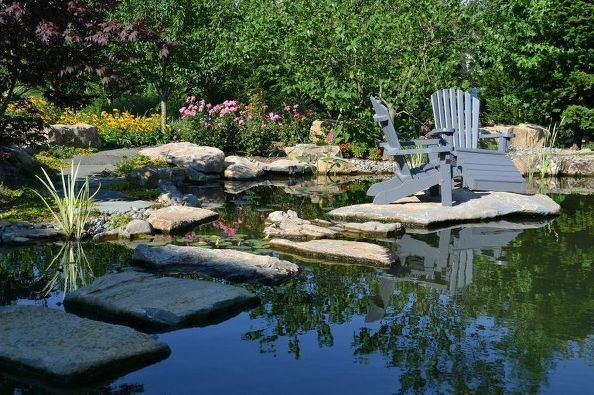 Fountains are not just for backyards. They are a wonderful indulgence at commercial offices as well — and as you can see from this winter scene, clearly a year-round uplift for management and staff. If you do not want the water to freeze, you can choose to winterize your water gardens/waterscapes by running them with heat, which will melt the ice dams. But that is not necessary. Note how the falling water aerates the pond water just underneath. Photo: Courtesy of Aquasacpe Inc. Photos of this pond (above) were shot at different angles, in different seasons. The first photo (Left) shows the pond after we had just built it, but had not yet started it up. It was quickly crushed with snow during the Northeast Blizzard of 2013. Note the boulder stepping stones and moss rock island covered in snow in the middle of the pond. 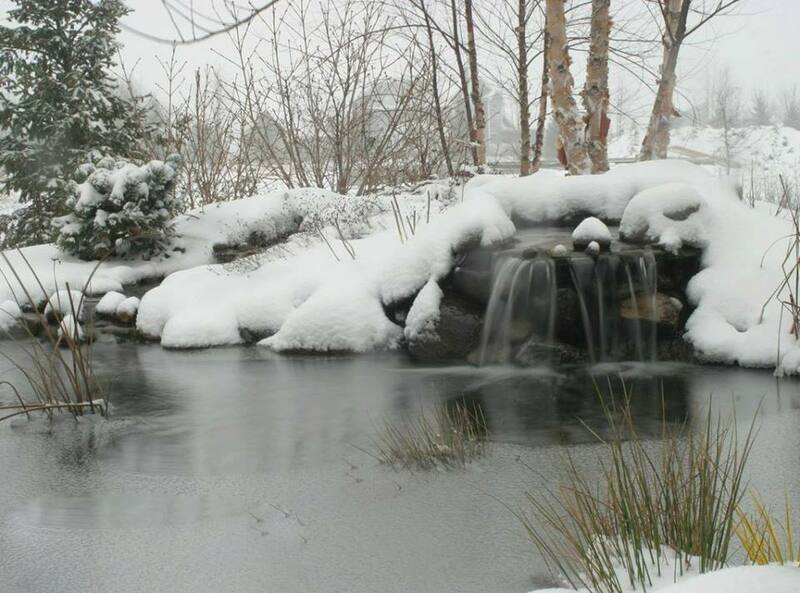 Despite the storm completely covering the water feature, we think the pond was as beautiful a sight as it was later that summer (Right) where you can see the pond’s stone island and stepping stones photographed the next summer free of snow. Expressions or idioms develop in a language for good reason. Take “being snowed,” i.e., to be deceived. Don’t laugh. There’s nothing trickier than snow. It captivates, delights, is romantic even, as it first covers the ground. But if there’s enough of it, when unprepared, we can find ourselves snowed in, snowed under, or snowed out. 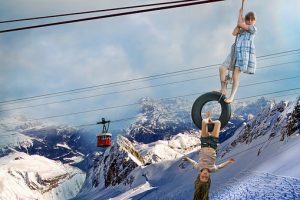 Even when the snow is light, if followed by sleet, and/or warming then freezing (common in our area), a driveway or walkway can become so slick, moving your family from the front door to the car can require the skills of a Cirque de Soleil acrobat. — Put some fresh batteries in your carbon monoxide monitor. Speaking of snow blowers. Even an inexpensive one is better than using a shovel. If you’re going to shovel, coat the scoop part with non-stick cooking spray. 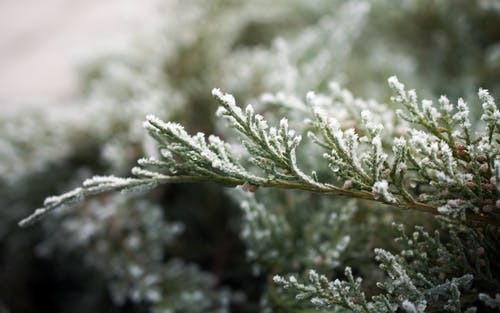 And lastly, whether you are using a snow blower or shoveling, remove the snow in small increments — don’t try to do it all at once. Now. The real fun begins. No matter who will be doing the plowing of your property — a firm like our own Dix Hills Snowplowing, or on your own — even before word that a storm is approaching, “prep” your property (or have it prepped) by installing fiberglass stakes (sometimes called “plow stakes” or “snow stakes”). 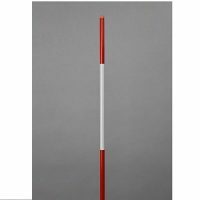 Note: wood plow/snow stakes aren’t as strong as fiberglass and can be easily damaged. The idea is to highlight where any costly Belgium Block or other edging is located, keeping it from being damaged by snow plows. 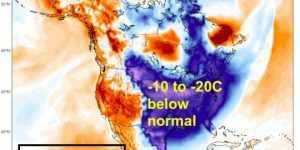 For more on this, click here. 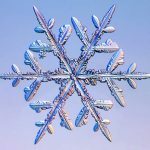 Snow can cause a lot of pressure on your roof. One of the best ways to remove it is with a roof rake, so it’s good to have it readily on hand. Also take a look at your gutters to make sure ice doesn’t dam them up and cause leaking into your home or attic. Some experts recommend stringing heat cables through them, or on the roof just above the gutters. 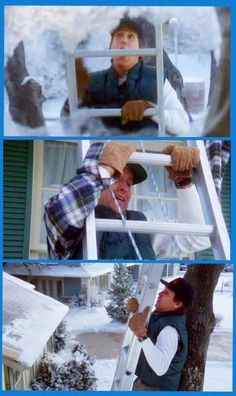 This should be done, of course, before major snowstorms to avoid any Clark Griswald-like ice rockets from a frozen gutter fail. 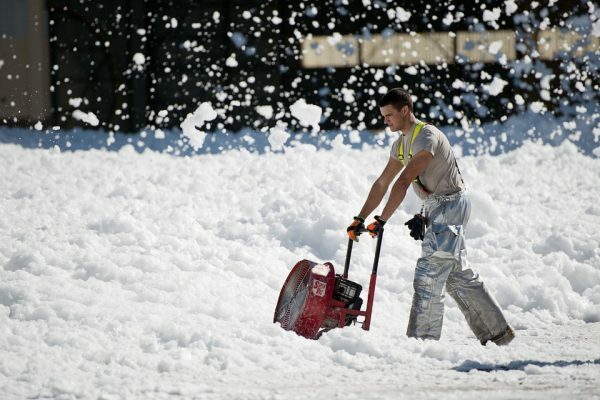 Of course, the easiest way to handle some of this is to contact professionals like Deck and Patio’s Dix Hills Snowplowing. In speaking with our own Office Manager, Linda LaRose, if you live in our corner of Suffolk County (Huntington/Dix Hills) and wish to have us take care of your snow removal, you can contact us with no obligation (631-549-8100). Once we hear from you, Linda will email a contract to review and you can always call her with questions before signing on, or incurring any expense. 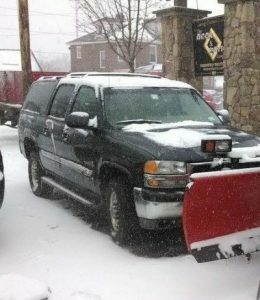 When you make this initial contact, this would be the right time to let us know if you have any special requirements: e.g., early service, service at 1-inch (ours usually begins at 2”), sand service, if garage doors need to shoveled, mail box cleared, etc.